I have few fixed expectations when watching catwalk shows. I haven't seen many, but enough to know in advance that there are two definites – the venue will be hot, and the music very, very loud. Beyond that the experience is unpredictable. One assumes that the formula (as described by Antoni & Alison – a topic for another post) of ‘Models walking up and down in dresses’ will be fulfilled, but the nature of the clothes is unknown. That's the truly exciting part - anything could emerge from the wings. London Fashion Week shows (and the events in her sister cities) require immediate, snap judgements – many of the people sitting in the front couple of rows will be primed to compose reports or easily quotable phrases in their heads (or on a tablet), so that the gap between the show and resulting coverage can be as small as possible. Some brands go as far as to tweet outfits as they emerge, in a bid for instantaneous exposure. Like many though, I do wonder where the logical end point of this ever-faster race is. The attention paid to fashion month is so extensive that when the clothes become available for sale six months on, they are already old news – you might be able to finally wear them, but those in the public eye will be already sporting pieces from the next collection, thus confusing the six month time lag between the show and the shops. As a blogger I feel that I should report on the shows I saw in the month after LFW, and yet wouldn’t it be more appropriate to do this when the clothes are available for purchase? I’m not sure if there is a definitive ‘right’ answer, and so for now I shall focus on what I appreciate the most – the designs themselves. · Scottish widow – too obvious to mention? The notes are a compressed concertina that can then be stretched out in an article for my blog or elsewhere. However, it’s hard not to cover page after page with exclamations and literature-based allusions (it brought to mind Angela Carter) when the show is as good as Corrie Nielsen's. Her designs are consistently brilliant, from the couture-cut shapes to the draped finale in which the model appeared to be wearing a satin counterpane - nipped, tucked and artfully shaped around her shoulders. It was dramatic, had a defined narrative and sent my thoughts off the Highlands quicker than you can say tartan. Moors and marsh and grey-sky mist. Are stitched and seamed in kilted ridges. a spider wove, in whites and reds. she moves between the hills and dips. skirts take flight in cloud-hung air. this twilight calls for lavish drapes. The outfit I am wearing above is a complete homage to Nielsen's wondrous designs. 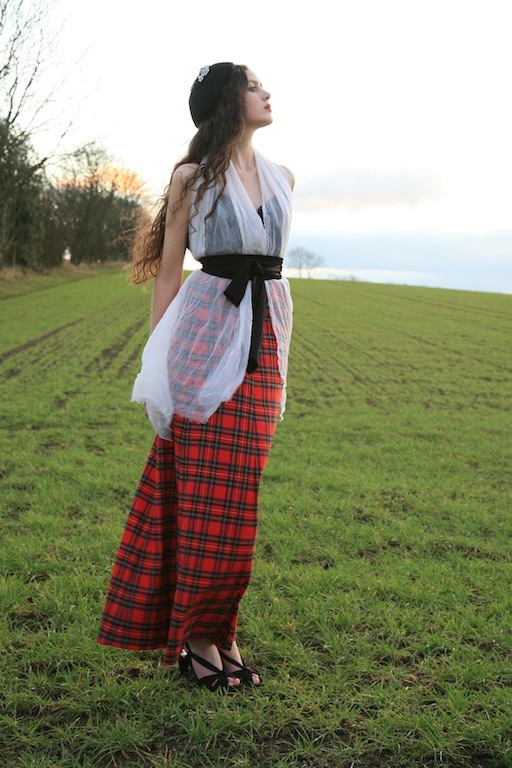 It was assembled using a 70s tartan skirt and a black slip from a jumble sale (for the collective sum of 40p! 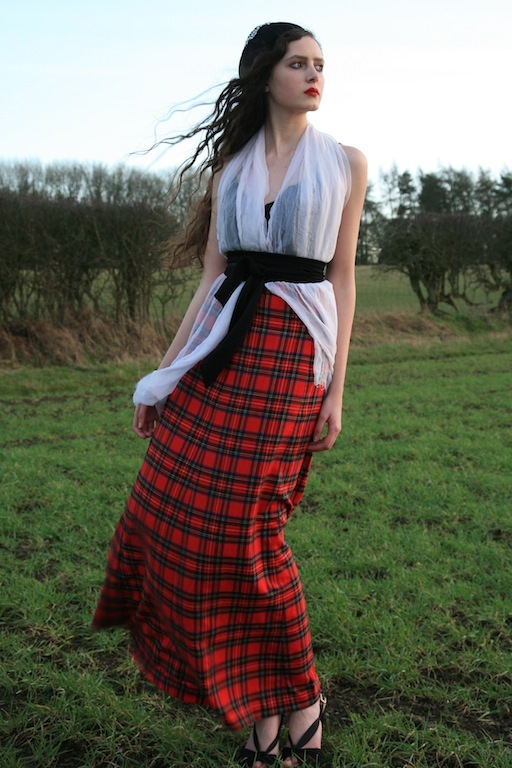 ), with a white scarf draped and tied in place using a vintage black sash. The black hat is also vintage, from a local market stall, and the shoes were from a charity shop. (The whole outfit cost less than £10). What a coincidence Roz, I read Pearl's post on this exact same show earlier today and was struck by the beautifully tailored designs of this collection. Tartan is such a beautiful material (and if there's one thing I hate about it it's hearing it being called plaid!!!) and of course always conjures up images of Scotland, kilts, bagpipes and the like. I love your show notes - so similar to what I reckon I would have put. That one about Havisham made me laugh! It does remind me of that McQueen collection from a few years ago with all the tartan and veils. Was that the one where he used antlers on the model's heads? I can't remember. Finally the poem is so articulate and flows perfectly. You are such a talented writer. I bet you were the most focused person on your train! One of the most beautiful faces, you are a true English rose. First, I love the outfit! I can totally see how you were inspired by the collection! Secondly, I feel the same way! I want to wait to post collections but at the same time I feel like I'll be late if I don't post them right away...fashion moves too slow and too fast at the same time, haha. Adore this. Your homage outfit is just perfect and your poetry is beautiful. Or the other way around, it really doesn`t matter as I love all of it so much. Lovely pictures, and your poem flowed so well, I just had to smile. Wow! bellas fotos! un outfit inspirado en la pasarelas! like it! I love your writing - the poem is wonderful! Imagine fashion coverage purely in verse?! As for the question of speedy reviews, I guess for me, it has so little to do with actually being able to own the clothes - because they re so far beyond my budget - but more to do with new inspiration. Like your outfit here, I might see something inspiring and reconsider the clothes I own/make something new/ sift through a charity shop until and reinterpret their ideas.I guess for this, there is no great need for speed either really? Except that it can be quite exciting to feel like you are up-to-date with the shows, when you are home after a long day at work, sitting at the other end of the earth! Ah, this is quite beautiful! Scotland was of course the first thing that came to mind whe seeing these. The outfit is brilliantly put together! I like your take on the designer's clothes.....the red tartan & that highland-ish location is a fit tribute to this lovely collection! Absolutely beautiful! Breath-taking photos and lovely references. Your outfit brought to mind many of the words you wrote down at the Corrie Nielson show, before I saw them, especially 'like cobwebs', 'gothic', 'tartan' and also reminded me of Alexander McQueen (Vivienne Westwood too!). That poem is wonderful, I always find poetry much harder to write than stories, but your wouldn't be out of place in a published book! Haha, I love your notes from the show! Your interpretation is also gorgeous-- the white scarf looks like a pretty top. I must try this. I rarely read a modern poem and like it, but I loved yours and loved how it was based on the show. I'll have to look up "tarn". So wonderfully romantic and inspired, and photographed beautifully. Also love the accompanying poem. you look so perfect like that !!! 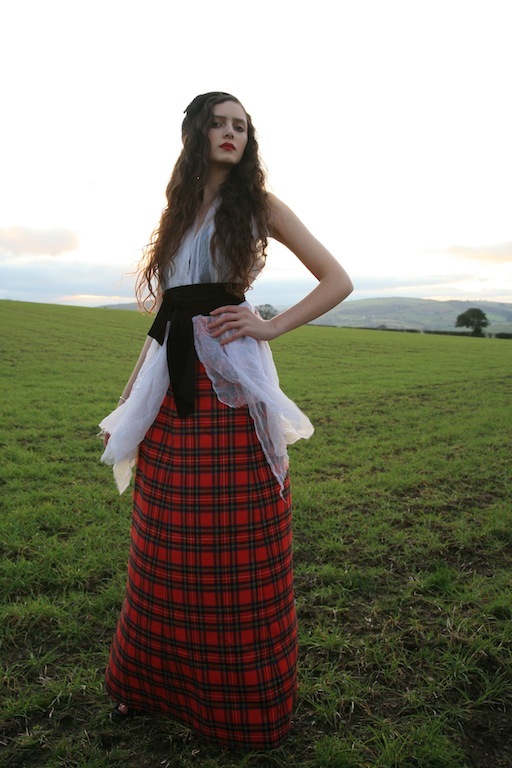 the long tartan skirt is just gorgeous ! I saw you in lots pf streetstylers sites lately, you look so lovely each time !! Hey Roz, I hopped on over from Dvora's site, I'm a loyal follower of hers! Now I'm your newest follower as you simply ooze style!! I like so much your personal style. Wow, you really deserve a compliment for your style and your blog! Impressive! I'm your latest follower and would be very happy if you dropped by for a visit at http://thecatsedge.blogspot.it/ ...and even more if you'll follow me back! 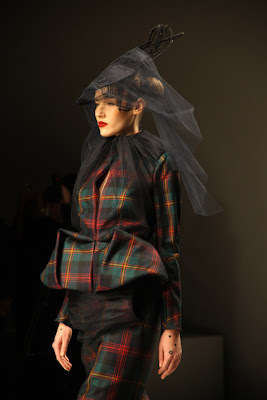 I love this Gothic, tartan assemblage, as I do the image of Miss Havisham transported to the highlands! I rather think she would have been coaxed outside of her cobwebbed existence with hills and tartans around her. tartan is becoming on you.